Shield Or with base wavy of Azure and Argent, two pine trees eradicated Vert fruited Or, in central chief a grapevine Purpure leaved Vert. Mural crown Argent with three visible towers (village rank) and white scroll with inscription in black initials: "ALDEIA DO MATO". Aldeia do Mato Commune was one of the pre-2013 communes of Abrantes Municipality (q.v. ); it had 441 inhabitants in 2011 and covered 31.7 km². Shield Or with base wavy of Azure and Argent, three chestnut (?) trees eradicated vert fruited Gules ordered 1:2. Mural crown Argent with three visible towers (village rank) and white scroll with inscription in black initials: "SOUTO - ABRANTES". 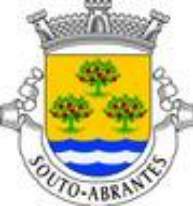 Souto Commune was one of the pre-2013 communes of Abrantes Municipality (q.v. ); it had 418 inhabitants in 2011 and covered 13.1 km².